A Healthy Love of Cycling, Food, Good Wine & Burgundy. A Healthy Love of Cycling, Good Food and Burgundy. Welcome to The Hungry Cyclist Lodge website, a small corner of the internet dedicated to my passion for cycling, food, wine & Burgundy. 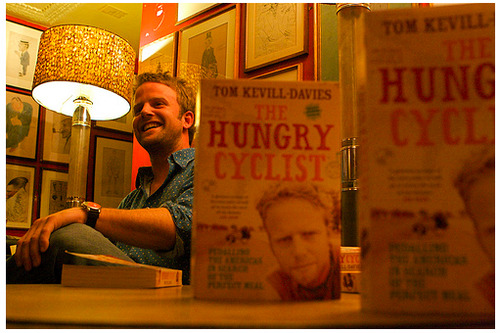 My name is Tom Kevill-Davies, I love riding my bicycles, I love to cook and I relish good food and wine. That is why I have chosen to live in Burgundy and by setting up The Hungry Cyclist Lodge I hope to share these passions with you. It has been a long and winding road to set up The Hungry Cyclist Lodge, but it is perhaps apt that this whole journey began in France in the summer of 2004. Taking my annual ten days holiday from the advertising agency where I worked, I decided to cycle the length of France. Pedalling for days and eating and drinking more than I should have, I discovered the wonderful marriage of cycling and food. At the end of this fateful trip, I decided to hang up my mouse and take to the road on my bicycle in search of the perfect meal. Over the next two and a half years I pedalled from New York to Rio de Janeiro. A mad mission that was driven by a desire to seek out the best cuisine in the Americas. A delicious adventure that culminated in the publication of my first book, The Hungry Cyclist - Pedaling The Americas for The Perfect Meal, which was short-listed for the Guild Of Food Writers Award in 2010. It was while on this trip that ideas begin to turn in my head about one day setting up a calming retreat in a delicious corner of the world where friends, family and guests could also enjoy the perfect marriage of cycling and good food. Returning from my Americas road trip, I worked on writing the book and went about cycling all over the world, eating, photographing and writing about food. In Brazil I witnessed the back breaking work of the local fishermen whose daily catch provides a perfect moqueca. I have been soaked-through by the monsoon rains that irrigate the paddy fields of Laos and I have suffered under the sun that dries the coffee beans in the mountain plantations of Colombia. I have camped next to rivers of migrating wild salmon in Canada, woken to the smell of fresh tortillas in Guatemala and sipped sweet tea with Bedouins under starry night skies in the deserts of Egypt. These, and many more adventures, all proved fascinating experiences and while the life of a food and travel writer was enjoyable, the idea of creating a cycling lodge was always there and this long-felt niggle led me to Burgundy. With my plans laid and with a need to learn my trade, I began working for one of the industry's leading cycle tour operators. Running gourmet cycling tours all over Europe, it was in Burgundy where I found a strong connection. Any spare time between leading cycling holidays was dedicated to hunting down properties that suited the needs of the project, in the autumn of 2012 while working the grape harvest, I stumbled across an abandoned watermill in the village of Auxey-Duresses. It was love at first sight! Biting off far more than I could chew the renovations have been as challenging as any adventure on my bicycle. Long and slow and with plenty of highs and lows, for the last two years I have worked with a small team to renovate the property and gardens into The Hungry Cyclist Lodge. Two long winters were spent camping on the cold stone floors. The dust has rarely settled and in the summer months, with no plumbing installed, a wash in the river was the only option. It has been a labour of love and it is with great satisfaction, and pride for the friends I have worked with, to be able write that a once-distant dream has now become a reality. While taking on this project my love for Burgundy as a region has only grown stronger. My understanding and enjoyment of the wines is always evolving. I am often out exploring on my bicycle and I am always learning. The food here is superb and I have been made to feel very welcome in a region I am incredibly lucky and proud to now call home. I take a huge amount of pleasure in sharing food, wine and cycling with others and that is why I have created The Hungry Cyclist Lodge and I very much look forward to welcoming you in Burgundy.